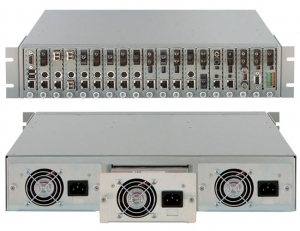 The 19-Module Chassis features up to three hot-swappable, redundant power supplies. Universal AC, 24VDC and 48VDC power supplies can be used in any combination. The power supplies operate in load-sharing mode to reduce the burden on each power supply to extend the lifetime and fault tolerance. The iConverter 19-Module Chassis supports the entire family of iConverter fibre media converters. All iConverter modules are hot swappable and support multiple mounting options.